Adventures in the Endless Pursuit of Entertainment: The Fleet Is In! 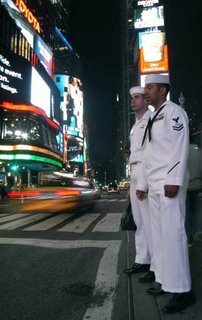 In honor of Fleet Week! OZZIE: Come on, Gabey, hurry up! SAILOR: Hey, why don't ya look where you're goin'. You'd think it was your first time in New York! GABEY, CHIP, OZZIE: New York, New York! It's a helluva town! GABEY: We've got one day here and not another minute to see the famous sights! OZZIE: We'll find the romance and danger waiting in it, Beneath the Broadway lights; But we've hair on our chests, so what we like the best are the nights! Sights! Lights! Nights! GABEY, CHIP, OZZIE: New York, New York, a helluva town. The Bronx is up, but the Battery's down. The people ride in a hole in the groun'. New York, New York, it's a helluva town! CHIP: Hey, Gabey! Gabey, look. Gabey, it says here "There are 20,000 streets in New York, not counting MacDougal Alley the heart of Green-Witch Village, a charming thoroughfare filled with..."
OZZIE: Here we go again! CHIP: The famous places to visit are so many, or so the guidebooks say. I promised Daddy I wouldn't miss on any. And we have just one day. Got to see the whole town from Yonkers on down to the Bay. GABEY, CHIP, OZZIE: In just one day! New York, New York, a visitor's place, Where no one lives on account of the pace, But seven millions are screaming for space. New York, New York, it's a visitor's place! GABEY: Hey! Look who's comin' back! It's Tom and Andy! OZZIE: Hey, Tom, Andy! Hey, fellas, how are the New York dames?ANDY: Wonderful - I don't remember a thing! TOM: Awful! I remember everything! OZZIE: Or eight on your way. GABEY, CHIP, OZZIE: In just one day! New York, New York, a helluva town. The Bronx is up, but the Battery's down. The people ride in a hole in the groun'. New York, New York, it's a helluva town!! One of my favorite shows/songs ever! 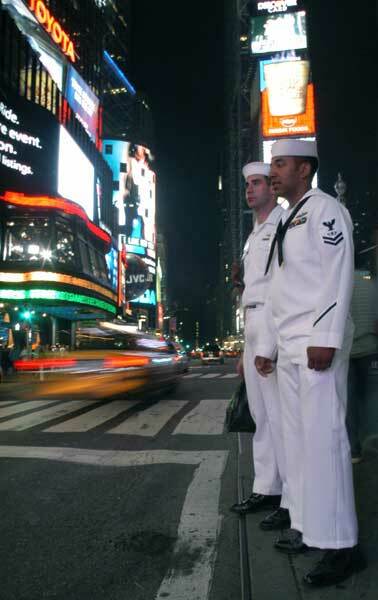 Great choice for fleet week!